course content. Even if students do not like taking regular quizzes, they see them as critical for learning and typically recognize that they benefited from studying while knowing that they would soon be quizzed on the material. As much of a pain as they may have been at the time, it made sure I didn't skip any readings and that I was truly understanding the material. I think it stops students from just trying to pass the class on memorization. I actually have a working knowledge of photography that I can use to speak with other photographers. I did find the quizzes to be helpful. They were a tool to reinforce the reading and helped me to pay better attention to what I was learning. I felt I did learn a lot from the quizzes and they challenged me. I thought the quizzes were very helpful…I definitely learned a lot of new things through those quizzes. From a student stand point a quiz practically everyday started to get on my nerves a tad but from a learning standpoint they forced me to learn the new material and then relearn it as we took a that next day. Also…we had "recapping" quizzes from time to time and those really helped me dig back into my brain, pull all that prior knowledge I had learned and bring it to the table to complete those quizzes successfully as well. All in all, as tedious as they were, the daily quizzes definitely helped me build my knowledge of photography. I found the quizzes to be extremely useful in helping me utilize the material inside and outside of class. The quizzes were also very useful when it came to remembering and studying the information for mid-term and final exams. Having a quiz every day exercised the knowledge I obtained from the videos and readings. Having quizzes every class period was definitely beneficial. The quizzes were specific to the reading and/or the video clips, so you had to keep up with the reading. The questions were also relatable to what was being taught that week, so you could put into action what you had read and studied. The questions were important because they weren't fluff, they asked the hard-hitting questions that you needed to know in order to do the work, and truly understand what you were doing as someone beginning their journey in photography. If you don't know the basics, you won't be able to move on, because you have to understand why you are using methods like spot metering, what is Lightroom, how a camera works, what a camera does, how lighting affects your shots etc. When students read questions on a quiz, the wording and vocabulary should help them remember the topic they recently studied. In other words, if they studied the pre-class materials, the questions should, in some way, look familiar. Questions should be clear, specific, thought provoking, and point toward the answers. The Teaching Center at Washington University, in St. Louis recommends that when creating questions the teacher should reflect on the goals of the course. “For example, do you want students to master core concepts? To develop their critical thinking skills? The questions you ask should help them practice these skills, as well as communicate to them the facts, ideas, and ways of thinking that are important to their learning in your course.” (2009) The U.S. Department of Education cites evidence from laboratory research, based on the “Testing Effect,” (Bjork, 1975) which demonstrates that testing helps students retain learned information. “Perhaps most importantly, researchers have found that having students take a test is almost always a more potent learning device than having students spend additional time studying the target material. This is especially true when the test requires students to actively recall information…That is, the act of recalling information from memory helps to cement the information to memory and thereby reduces forgetting.” (2015) Preventing the act of forgetting, as opposed to enhancing remembering, is one of the key strategies of using quizzes as a learning tool. Current brain science reflects forgetting as an active principle that, through a variety of strategies, can be averted. (Bjork Learning & Forgetting Lab, 1/7/15) Quizzing causes students to short circuit the act of forgetting by recalling information and thus reinforcing it in memory. The more opportunities students have to recall information, the more the neural connections to that information are established. When the neural pathways are reliably formed, then information is easily retrievable. By utilizing quizzes to help students memorize information like shutter speed numbers, aperture settings, the relationship between aperture and shutter speed numbers and the connection between aperture numbers and depth of field, the student photographer is able to utilize that information in order to pre-visualize and capture high quality images. Without access to this knowledge the beginning photographer could use their smart phone to do an Internet search for how to get a photo with a small depth of field, but the time they get the information, they may have missed the most opportune time for the shot. Information that is successfully memorized integrates with prior knowledge about photography to become the base of knowledge and understanding that is being assessed. The quiz should offer opportunities for students to demonstrate what they learned along with how they have grown intellectually in their study of photography. To confirm the purpose of questions and how they will achieve the goals it is helpful to review the learning outcomes intended for lesson and the course. Questions on testing instruments have the potential to help students activate prior knowledge while helping them to build on that knowledge. In other words, when students come to the quiz after studying about a photography topic, instead of just asking them what they know and what they learned, questions could be designed as tools to effectively help them learn more deeply about the photo topic through consideration. For example, a question that asks students to briefly explain, like How is photography used by others to influence you? makes students think about the power photos can have over people’s preferences and opinions. Or, a teacher may ask students to describe how to get a proper meter reading when making a portrait of a person in a room that is standing with their back to a sunny window. Part of the quiz could also allow for students to defend incorrect answers after grading by submitting a written explanation. The teacher then, sees evidence of the student’s logic and may decide to award partial credit. Whatever misconceptions are revealed in the process can be make clear by the teacher. This outline is worth 3 points toward your quiz score. Please fill this Study Sheet out & bring it with you to class. Bullet point important informational topics each video or reading talks about. In the bullet point, summarize the overall topics of each portion of homework. Think of one authentic question you have about the reading and video. Q. Based on your current knowledge of photography and before you begin learning, share a question you have about one of the topics presented here. how does that perception apply to your life? analyzing and considering what you learned. They may begin with who, what, where, or why. Questions could be inspired by confusion or curiosity. An example of an irrelevant question is, “Which one of these lenses is the best?” This kind of question, the way it is stated, has no answer. What elements or styles characterize these photographers’ work? Students have a limited amount of time to devote to learning between classes so study-sheets are vital for helping them make efficient use of their time. Study-sheets guide student attention toward the most important topics in teacher-supplied resources. Students who fully engage the course content and the study guide are almost guaranteed to be more successful in their learning and on their quiz performance. As an incentive for students to actively connect with the material, the low-stakes study-sheets offer a few points to be added to their final quiz score. In this model, the study-sheet is worth only 3 points. So, the quiz is worth 7 points, with three points possible for the study guide, bringing the total number of points possible to 10 out of one thousand possible points for the course. A practice quiz or test is another learning aid that can be offered in addition to or in lieu of the study-sheet. Any strategies the teacher can use to support student learning, especially when it causes them to engage the course content, are beneficial. All methods that help students fully assimilate what they are learning about photography will improve their chances academic success in photography. Many times, individual students will have their own unique obstacles that prevent them from understanding key points in the study materials. One way to send them back to the readings or videos is to offer the option to retake quizzes or tests or even include specially designed extra-credit questions that will send them back to study the information on topics they did not totally understand. Questions have the power to teach, inspire, and create. Laura Arnold Leibman expresses that, “I want my students to feel their questions matter, that history was about actual people, that they can develop hypotheses about the past and use data and evidence to test the validity of those hypotheses.” (2/22/15) In fact, photography was founded by the question, “Can an image be permanently fixed?” From that point on, questions have influenced the ongoing evolution of the field. In 1872 Leland Stanford, the founder of Stanford University, had a question to which he thought he knew the answer. Stanford wondered, “Is there was a split-second when a racehorse’s hooves are all off the ground at the same time?” (Brittanica, 2014) Many Stanford’s contemporaries had conflicting opinions on the puzzle, but Stanford speculated that for a brief period, a horse is airborne, so he placed a bet to back up his belief in his theory. Then, he hired landscape photographer Eadweard Muybridge to definitively answer the question. Muybridge’s famous photo series of a running horse proved Stanford’s presumption to be right. Muybridge’s motion photographs changed the popular perception of both movement and photography and became the forerunner of the modern cinema. (Ulaby, 2010) In 1949 Edwin Land’s 3 year old daughter ask him, “Why do we have to wait for a picture?” This question inspired Land to invent the Polaroid Camera. (Whitkay, 2014) As was the case of Eadweard Muybridge, questions help photographers seek deeper understanding and without Edwin Land’s consideration for his daughter’s question, Polaroid might not have been invented. One item on the quiz study-sheet should be a request for students to propose authentic, genuine questions that come about from considering the study material. The purposes for this request are to awaken students’ natural sense of curiosity and to get them practicing their ability to think about how what they are learning relates to their prior knowledge of photography. It is also meant to bring to students’ attention to gaps in their learning and how what they are learning can benefit their abilities in, understanding of, and appreciation for photography. The ability to ask critical questions will become crucial later in students’ higher levels of photographic study, during critique and the study of critical theory. By investing in an early practice of formulating questions a foundation is laid for practice of inquiry. Helping students learn how to come up with questions and recognize what authentic, genuine questions look like, is one of the first steps in a student’s learning process. Authentic, genuine questions arise from a deeper consideration or because of confusion or misunderstandings. In any case, the act of formulating real questions encourages students to think, to utilize higher order cognitive abilities, such as divergent and critical thinking skills. (McComas, & Abraham 1/10/15) It also stimulates metacognitive and creative thinking processes that will come in to play during the practice of critique and analysis of photographs. In other words, “Questions can help students decode, interpret, and understand photographs thoughtfully and meaningfully.” (Thibault & Walbert, 1/11/15) Questions help students think, ask more questions, and grow intellectually. This process begins with students being able to understand the power of a question. Students do not realize it, but they predictably approach their photographic study with the question, Why should this matter to me? It is a question worthy of consideration, for both the students and the teacher. By discussing this kind of essential question with peers, students can uncover answers for themselves and in doing so help them find meaningful purpose in their study of photography. It is the first important question from which all questions come. Other than essential questions, there are enquiries that seek clarification or elaboration. For example students may want to know more about the topic than the study materials cover. There are also hypothetical questions, strategic questions, divergent, probing, and inventive questions. (McKenzie, 1997) Questions can arise from critical thinking and consideration about a topic. For a photography curriculum, questions are important because they help build a culture of intellectual inquiry. If students can deeply engage what they are learning and think about how it applies to their lives, then questions will naturally arise our of curiosity. If learners can approach the study materials with the intention of formulating questions, then they are constantly on the lookout for gaps in their understanding or ways the new material is confusing or doesn’t make sense. Clearly articulating genuine questions requires curiosity and some time to think about the subject matter. Questions are a vehicle for learning and must be formulated to further the intellectual capacity of the learner. “Powerful questions – smart questions, if you will – are the foundation for information power, engaged learning and information literacy. Sadly, most studies of classroom exchanges in the past few decades report that student questions have been an endangered species for quite some time.” (Jamieson McKenzie, 1997) Daniel Pink said that, “…being able to ask the right questions is more valuable than producing the right answers….” (2012) The quality of questions that students ask does matter. Superficial queries, like which brand of camera is best, or what happens if my camera’s memory card gets full illustrate the kinds of questions that can easily be answered with an internet search and are typically used as a means of quickly fulfilling the study-sheet requirement. These answers demand as little thought and effort as possible. It is up to the photo-educator to help students learn how to ask more relevant, critical questions that directly pertain to the student’s relationship to the course content. Students depend on photo teachers to help them move “…from viewing questions as devices by which one evaluates the specifics of learning to conceptualizing questions as a means of actively processing, thinking about, and using information productively.” (Hunkins, 1995) In other words, students will gain a better understanding of how to formulate questions if teachers can help them understand how questions help them learn. Many methods have been developed to help students formulate learning questions from their study materials. Here are a few steps to help students generate authentic questions. To start with the students should view the topics in the study materials as focal points for generating questions. The kind of questions that are most important in this exercise are open-ended questions (as opposed to any questions that could be answered with a “yes” or “no”). Open-ended questions generate thoughtful conclusions, creative ideas, or informed theories. So learners do not get disheartened in the process, teachers are encouraged to express that coming up with good, authentic questions take practice. The next step is to regularly and periodically pause to write down questions during the active pre-class study of readings and/or videos. Questions might arise from thinking about how the information and ideas presented could relate to a student’s life or how it could change their point of view. Anything at all that seems unclear warrants a question. The quality of the questions does not matter at this point. What is important is that questions are formulated and written down as they occur during the first contact with the readings and videos. At the end of the study period, questions are reviewed, clarified, revised, and considered for their quality. The best questions will cause students to evaluate, synthesize and analyze information they are learning. These kinds of questions are formed from a sense of curiosity and/or intellectual inquiry. Questions should also address areas where a student is authentically confused or needs additional information in order to understand the topic. The highest quality questions are recorded on the study-sheet. Study-sheets are handed in when the quizzes are taken at the beginning of class. When study-sheets are returned with the quizzes, students will discuss them with their peers and conduct research, if necessary, in an attempt to articulate suitable answers. After that, students may receive additional input from the teacher. There is an acronym used in education, QUILT, which stands for Questioning and Understanding to Improve Learning and Thinking. The idea behind this acronym is that asking authentic questions helps students to effectively learn, and applies to whether they are devising the questions or answering the questions. (Appalachia Educational Laboratory, 1997) Learning occurs most effectively when students are able to come up with authentic questions and answer those questions on their own, but getting peer feedback is also very effective because there may not be just one answer. Students are paired up and given a short time to discuss each other’s study-sheet questions so they can research, hypothesize, and speculate on answers. They can go back to the study materials to use the information and/or do Internet searches to answer questions. Some questions may not even have a right answer. For example, a question like, “Is it unethical to edit out facial features (like moles) in portraits ethical?” lends its self to more subjective, insightful types of answers. -Offers a second chance for learning, especially for students who just did not understand the first time around. Some teachers do not like to offer extra-credit, but to put this concept into perspective each bonus question on a quiz is only worth 1/1000th of their overall grade. The purpose of offering these extra-credit questions is not to give an unmotivated student a way to gain points in place of work they did not do, but to take advantage of the opportunity to redirect students back to topics they misunderstood, giving them another chance to learn. Grading Quizzes, Tests, and Study-Sheets. Grading quizzes and tests is can be a time consuming chore for teachers but luckily there are some solutions that can help lessen the impact while at the same time facilitating further learning. One solution is with peer-grading. In 2001 the Supreme Court unanimously ruled, in Falvo v. Owasso School System, that the peer-grading of tests is a legal, valuable practice for supporting student learning while, concurrently saving time for teachers. (FindLaw 1/12/15) Research also supports the mutual benefits for both teachers and students. For example, one study concluded that peer-grading can force students to think critically and feel empowered by their shared (with teachers and peers) responsibility in their learning process. (Sadler & Good, 2006) Teachers benefit in time saved, but also the process becomes a tool for reinforcing the ideas and information in the course content. Even though the Supreme Court allows students to know the identities of their quiz-mates, it is easy enough to cover the names with post-it notes and copy the finished quizzes. To add another element of discovery and recognition in the students’ ongoing emersion experience in photography, new names could be assigned to the quizzes. Post-it notes could read, William Henry Fox Talbot, Nicephore Niepce, Jacques Mande Daguerre, Alfred Stieglitz, Julia Margaret Cameron, Ansel Adams, or Dorothea Lange. The copied quizzes are then redistributed randomly, taking care that no one receives their own quiz. Another solution is to use a Learning Management System to administer and grade quizzes and/or tests. There are also online resources that will accomplish the same goals, like QuizStar and Thatquiz. Quizrevolution is a fee-based site, but has a free option. Teachers can also use Google Forms to administer quizzes and grading is simplified because answers are organized on an easy to read spreadsheet. There are advantages to using an LMS or online quiz system, for example questions can include video clips, links to reference photos, interactive graphics, and most importantly, students (and teachers) receive immediate feedback on their answers. Immediate feedback offers the greatest potential for learning so students benefit. Also, in many systems there is an option for the teacher to include pop-up tips for how to improve learning when a student answers a question incorrectly. These tips can lessen the impact of getting a question wrong. Lastly, with an LMS, no paper is needed. 1. Students will need access to computers with Internet (quizzes could be completed using mobile devices, but not everyone may have one). 2. Questions that work best are multiple choice, fill in the blank, and True or False. These types of questions tend to limit a student’s freedom for using higher order thinking skills. 3. Short answer or essay answers will still have to be graded by the teacher. 4. Time invested by teacher to set up. 5. Variable reliability of technology – potential glitches to problem solve. 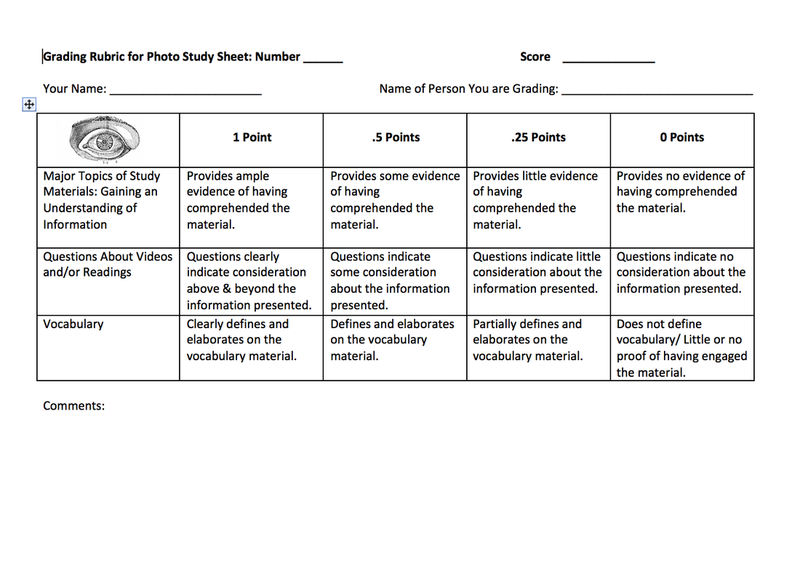 Study-sheets can be graded either on a rubric scale or using a complete/incomplete approach. The important thing to remember about the study-sheet is that it is merely a tool to direct students’ attention toward the learning objectives while preparing them for the quiz. Only a few points are awarded for the study-sheet, and though small in percentage of the quiz grade, become important for students that want to do well on the quizzes. Even 3 points can make a significant difference on a 10-point quiz, but will have an insignificant impact on the overall summative grade for the course. As part of a learner-centered approach to teaching it is important to involve students in their learning process as makers of course content. In regard to quizzes, it can be a beneficial learning practice to task students to come up with questions in order to make their own quiz. In other words, each student is requested to devise three questions over a designated portion of the study materials. The night before the quiz students are responsible for sending the questions and the answers to the teacher. This assignment causes students to approach their study from a different perspective than they would normally would. Instead of merely studying to learn and comprehend the material, they now must learn and comprehend at a level that is clear enough to be able to devise accurate questions for readers. Students also have to learn the material well enough to be able to answer the questions they ask. Since there may be more students in the class than questions, given a ten or seven question quiz, the teacher can put one question from each person on the quiz and tell the students they are free to choose 7 (or 10) questions they would like to answer. This gives students some control over their quiz. When it comes time to discuss quiz answers each student can present their own quiz question and explain the answer. Teachers are responsible for composing the quiz by compiling questions from the pool they receive from the class. Some questions will be intentionally difficult, some will be unintentionally vague, and some will be easy to understand and well composed. The teacher can simplify, clarify, and choose the questions that best align with the learning objectives. If necessary, the teacher can always supplement the quiz with question or two. If students can work in teams or in pairs it creates a potentially beneficial situation when preparing for quizzes. When students study cooperatively it can increase their chances of success on quizzes and/or tests. Researchers have shown, for quite some time, that students become motivated when they can collaborate around a common goal, like to perform well on a test. (Slavin, 1995) One effective strategy for cooperative studying is for students to devise their own practice quizzes on the study materials and administer them to their partner(s). There are many free online resources that offer students the ability to generate multiple types of quizzes for their own use. Quizyourfriends and Quizlet are two free sites commonly used by students. Daily quizzes can be stressful, but when students can work together to take quizzes or tests, their level of anxiety and stress tends to decrease. (Miller, 2008) This is the case partly because students are able to get immediate feedback on their answers while being exposed to opportunities to bond with others while acquiring a deeper understanding of the study material. The dynamics of a team can offer emotional and intellectual support that takes individual students beyond their limited understanding of the topics in order to accomplish the common goal of high academic achievement. (Silberman, 1996) Students also tend to develop more positive attitudes toward their peers and the subject they are studying, in this case photography. (Slusser & Erickson, 2006) In what is commonly referred to as 2-Stage Exam method, the team quizzes are administered immediately after the individual quizzes are finished. Typically teams can be allowed to use their notes (which encourages everyone to take thorough notes while studying) and/or their study-sheets. It is advised they not be able to use primary sources like readings or videos during the quiz because it will greatly lengthen the time students spend on the quiz. It also creates a situation where students can become frustrated. Instead of being an instrument of assessing and building upon knowledge, it becomes a game in which each question is a challenge for someone in the group to find the correct answer in the readings or videos. Another benefit of collaborative, 2-Stage testing is that by the end of the team quiz everyone has a very good idea about which questions each team member got right and which ones they got wrong on their individual quizzes. The team quiz affords students a chance to answer questions for a second time while making sure they get the answer right. This immediate feedback provides an invaluable learning opportunity to take place. Research supports that, “The response format that promoted greatest retention, greatest confidence, and greatest accuracy at identifying initial responses (correct and incorrect) was immediate feedback coupled with the opportunity to answer-until-correct.” (Dihoff, Brosvic, & Epstein, 2003) Interesting issues will come up when groups work cooperatively on testing. For example a couple of people in a group may answer a question correctly, but the answer on the team quiz is wrong. It is a situation where group dynamics influence the ways final answers are determined, which presents a good teaching moment. Teachers can advise students to rely on and trust the evidence in their notes or study guides. By helping students gain confidence in their knowledge they are able to own their part in the study of photography. An effective teacher always questions if the classroom strategies they are using are working to increase student achievement. In other words, are the teaching methods succeeding in furthering students’ knowledge, skills, and abilities in photography? One way to assess the effectiveness of individual and team quizzing methods is to collect data over the semesters and analyze the evidence to inform future teaching methods. If the evidence collected supports continuing a current strategy, then great. If the data shows that current methods are not working, then it is time to explore ways to modify the strategies for more successful results. There will always be circumstances where students will miss class and consequently miss tests. Jury duty, doctor’s appointments, sports events, family issues, and illness are unavoidable. Absences can also be the result from oversleeping, stress, anxiety, and depression. Students also fabricate excuses in order to avoid going to class and taking tests. One study found that “…72 percent of the student sample surveyed indicated they had asked to be excused under false pretenses while in college.” (Weimer, 2012) For whatever reason, legitimate or not, a learner that does not come to class impacts themselves (their grade), the class (their contribution), and the teacher as well. Teachers are faced with creating some kind of makeup policy so learners will know what consequences, if any, they can expect from their actions. Colleges and Universities usually have boilerplate example for policies. Many institutions recommend that whatever policy a teacher chooses, it be recorded on their syllabus. Research for this book revealed that over two-thirds of the photography instructor syllabi sampled online do not include policies for makeup tests. (Church, 2015) In order to avoid confusion and conflict with students it is prudent to have a policy available. Doing so will help students to know what to expect as a result of their absence. It could prevent the situation where students show up during office hours to try and negotiate a policy that will likely work to their benefit. Among photo-educators that do include makeup policy information on their syllabi, those policies differ widely. For example, in a survey photography teachers Paul Turounet, Tina Doyle, Jennifer Daly, Crystal McBrayer, Laurie Hartman, Brian Masck, and Daniel S. Grohs take the most popular approach and do not offer makeup quizzes if students are not able to make class. Some teachers, like Erika Buchanan, C. Rock, Kathy Lovas, Deana Thai, Craig Carlson, and Chris Mortenson, allow makeup quizzes if the absence is excused. Others allow quizzes to be retaken with a penalty in grade, like -10%. Professors Phil Snyder and Matt Truitt allow students to take a quiz early if the student makes arrangements for the missed class. Greg Clayton offers students several optional make-up quizzes at the end of the semester. Rene West offers tests (quizzes & exams) online for one week before the due date. And, failure to take tests by 11 pm on day of the exam will result in a zero for that test score. Jennifer Daly makes quizzes available on-line for one week and are not be available after the closing date. A handful of photo-educators, like Steve Carragher and William Tolan allow for makeup tests as long as the student lets the teacher know ahead of time they are missing the class and the student takes the initiative to contact the teacher and arrange for a mutually beneficial time to take the test before the next class. This model relies on the student to take full responsibility for staying in communication about their planned absence and their intention to complete any outstanding coursework. Most teachers are willing to invest a lot of time in their student’s photographic education, but the unfortunate reality is that having to regularly administer makeup tests takes up valuable teacher time outside of class. Educators may even feel compelled spend more time making different versions of quizzes or exams in an attempt to prevent cheating. Office hours are a prime time for students to complete missed tests, but sometimes students can not make it. As a result, tests often have to take place at unconventional times outside of class, when both the teacher and the student are available. Institutions may have testing centers available where quizzes or exams can be administered, thus relieving teachers of the burden of dedicating time to makeups. Utilizing testing centers also saves students time by opening up the timeframe for when they can take the tests. Students appreciate any consideration faculty have for accommodating their busy schedules, creating good will toward the teacher, the class, and the curriculum.